The traditional Southern fried chicken ready for Sunday dinner. 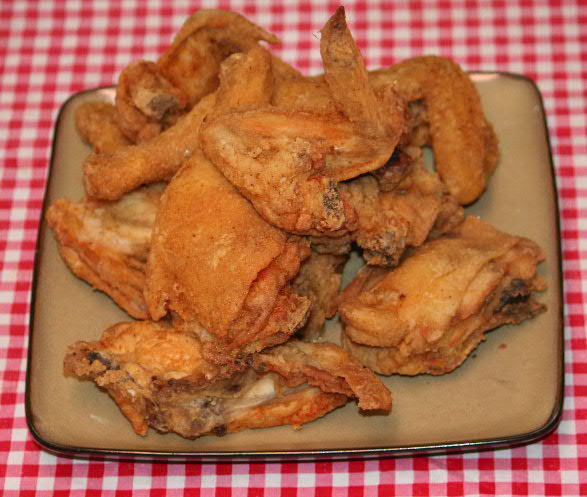 The traditional fried chicken of the deep South is a simple product made from a freshly cut-up chicken that is shook in a bag with a mix of flour, salt and black pepper and fried in hot oil. Multi-million-dollar businesses have been built on variations of this technique with changes in seasonings, frying methods and marinate soakings in attempts to derive a product that is sufficiently distinctive that a customer will select one brand over another. Before trashing around with an infinite range of possibilities, it is best to first master this basic recipe and then, if you can improve upon it, go for it. This recipe is the fried chicken for Sunday dinner, church socials, visits from in-laws and family meals. It is made by flouring a damp, cut-up fryer in a mix of one cup of flour, one tablespoon of salt and one-quarter tablespoon of black pepper and frying in sufficient oil to cover the chicken. For frying, younger chickens are preferred (so-called fryers). These have tender meat, have smaller pieces for quicker frying and cut up easier. Huge-breasted chickens are not desired because the outside portions of thick breasts can become hard and dry as they overcook while you are trying to insure that the meat next to the rib bones is done. Avoiding this differential cooking is why chicken “tenders,” “nuggets” and “strips” are so popular. Murray Carter (center rear) giving instructions to his class on forging Japanese knives. A robust knife is needed to cut up a chicken. This can be a 10-inch knife of the traditional “butcher” pattern with a peaked swell closest to the point. This weight-forward blade permits this knife to function something like a cleaver for easily chopping through joints. If you have a lot of production to do, one hit with a cleaver will split the breast nicely as well as separate the back from it. Many families feel uncomfortable with having a cleaver in the house, so a 10-inch butcher knife is a reasonable choice for occasional use. It works significantly better than a similar length slicer, boning or Chef’s knife. I often find myself using a Japanese pattern utility knife that has a straight blade, rather than the pronounced curve of the Chef’s knife. This is the type of knife shown in the accompanying video. I made this knife using traditional techniques at Murray Carter’s forge in Washington State during one of his knife-making classes. Because of likely bacterial contamination, wash any knives, cutting boards and tools used on chicken before processing any other products using these implements. It is dangerous to cut up a chicken, wipe the board with a cloth and then use that same knife and board for cutting up salad or other ingredients that will not be cooked. WASH these before using them on anything else. Rather than cook in a traditional black-iron frying pan, I like a high-walled heavy pot and use the bottom of my pressure cooker. The chicken will displace considerable oil and you need to have two or more inches of space between the top of the oil and the chicken to prevent the oil from boiling over. I prefer to fry in Canola Oil. This will take more heat before smoking than Olive Oil and a bit less than Wesson or Peanut Oil. These last two oils will give a crisper end product, but the Canola Oil is healthier for you. The oil needs to be at frying temperature before you put the chicken into it. Test by taking a pinch of floured skin and dropping it in. If it instantly bubbles and reacts vigorously in the oil, the oil is ready. After the chicken is added, you will want to turn down the heat to prevent the oil from splattering out of the pan and possibly catching fire. Always keep a pot lid handy to smother a fire should one start in the pan. Even in a large pot, I fry in batches. I start the breasts and back pieces and then follow-up with the remaining pieces after removing the breasts and back. These are drained on unprinted white paper or the brown paper from paper sacks. You may also use paper towelling, but avoid any paper that is printed – particularly colored newsprint. The chicken will smell wonderful, but delay in starting to eat it until the oil has cooled sufficiently to keep from frying the inside of your mouth. Once you taste it, pay particular attention to how salty it is and if this level of salt taste is what you want. Most of us need to reduce our salt, yet commercial fried chicken is loaded with it. One significant reason for cooking your own chicken is being able to control the amount of salt. The tablespoon of salt per cup of flour will be slightly salty, but not overly so. Taste will also depend on how often the oil has been previously used. You never want to fry your chicken in oil that has been previously used to fry fish. The following video “Secrets of Southern Fried Chicken” will take you through the process. I have another on YouTube “Cutting Up and Flouring Southern Fried Chicken” which covers these previous steps. You can see than one by clicking on the following link: http://youtu.be/eyR5hm0cn70 . As I was pondering your blog post it suddenly occurred to me to me that I can completely relate to your viewpoint….